Finally, after a few days of difficult work, it's here: the prototype for kdev-python's new GHNS support for documentation data! The upload dialog requires current kdelibs 4.10 (stable doesn't work) because of a bug I fixed there which prevented changing the provider to something other than the default opendesktop.org one. There's also a patch of mine pending review for libattica to fix a bug causing annoying spoof-checker warnings to be displayed when connecting. The feature is currently residing in the "ghns" branch of kdev-python, so if you want to try it, you'll have to compile that branch. Packages should be for one Python module specifically. Please don't make packages which are like "CoolNick47™'s perfect collection of kdev-python docfiles", but keep them very specific, e.g. 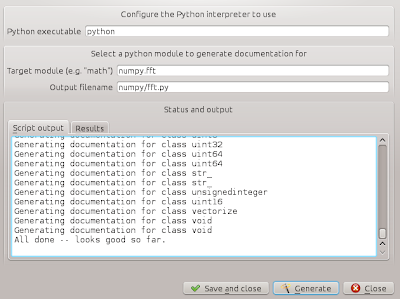 "Documentation for numpy.fft" or "django 1.5 fixes". 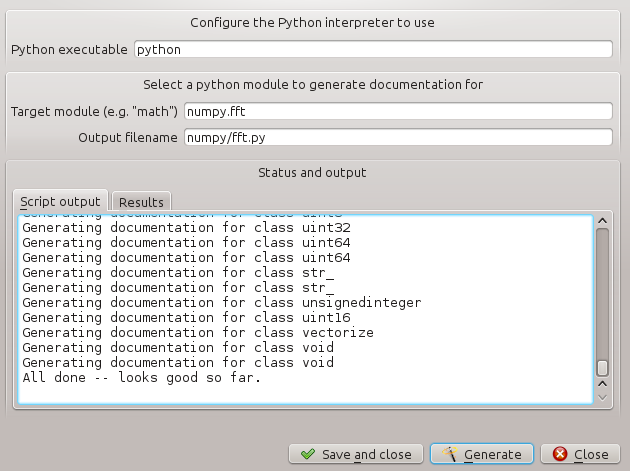 It allows you to enter the name of any python module and let a script generate documentation for it based on introspection and docstring parsing. You can inspect the result and decide whether it's worth saving or not. The script being run is introspect.py from kdev_python's DATA_INSTALL_DIR, so if you like, you can run it manually. The dialog is mainly there for discoverability of this feature. 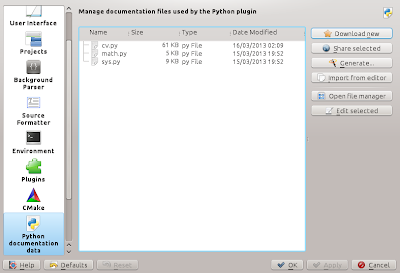 This tool copies the contents of the file currently open in the editor to a new file in the documentation directory and opens the new file in the editor. This might seem a bit weird at first, but it has a very clear use case: you discovered an error in an existing source file which was bundled with kdev-python, or, equally likely, a file from some Python library which contains a section kdev-python's analyzer does not understand. If you find out about this, you will most likely have that file opened at the moment (that's how you found out, right? ), so here's an easy method to modify it -- in a way which only kdev-python, but not your real application will notice. 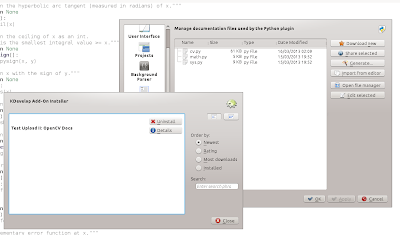 Opens all selected files in KDevelop's editor in the background so you can adjust them. The server must corretcly save all fields which you can fill out in the upload dialog, currently License, and the preview images don't work. A better way to host the server must be found. I'll talk to the KDE sysadmins about this. At least, the file with the server URL should be somewhere on kdevelop.org, not on my (totally unrelated) domain. The dialogs do not handle subdirectories correctly, e.g. they are not being created automatically and some can't even write into them yet. This is rather urgent to fix, I'll do it asap. That's all, I hope it'll be useful! If you think something else would be good to have in this area, please let me know.